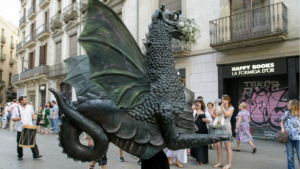 On Sant Jordi (saint Jorge’s day), the city of Barcelona is invaded by books and roses. The date coincides with the beginning of Spring, as well as with the burial of Miguel de Cervantes and the death of William Shakespeare (according with the Julian calendar; he died on May 3 according to the Gregorian calendar), in 1616. Traditionally, boys give girls a rose and girls give boys a book. 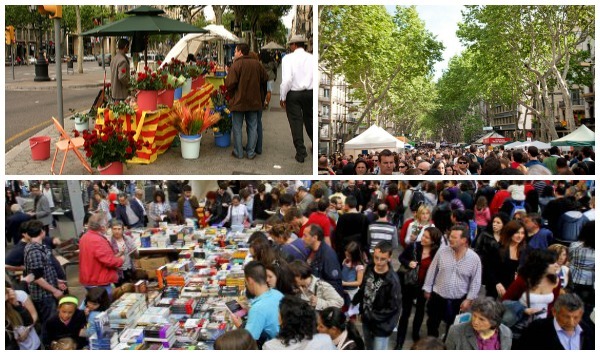 As reported by the media, 1.6 millions books and 6 millions roses were sold in Catalonia in April 23, 2017. It is really impressive to see hoy many Barcelonians walk the streets visiting the book and roses’ stands placed along them. 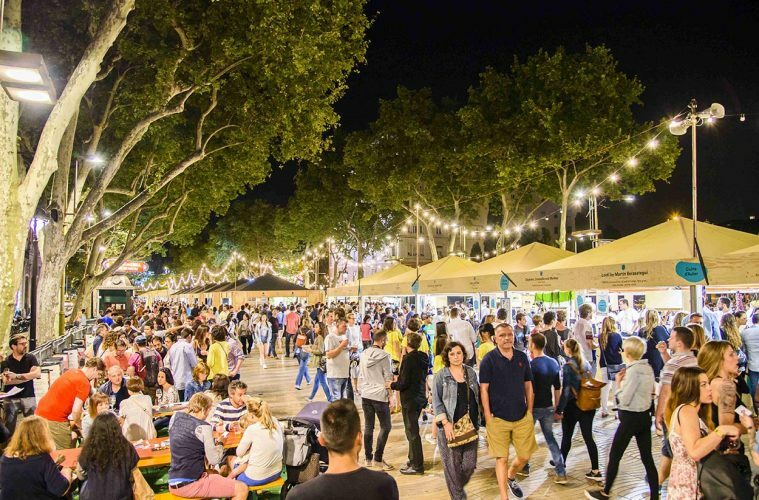 Do not miss visiting the streets Rambla de Catalunya, Passeig de Gràcia and La Rambla on this day! Friday, April 27: from 18.00 h to 03:30 h.
Saturday, April 28: from 10.00 h to 03:30 h.
Sunday, April 29: from 10:00 to 00:00 h.
Monday, April 30: from 10 to 03:30 h.
Tuesday, May 1: from 10:00 to 00:00 h.
Wednesday, May 2: from 10:00 to 00:00 h.
Thursday, May 3: from 10:00 to 00:00 h.
Friday, May 4: from 10:00 to 03:30 h.
Saturday, May 5: from 10:00 to 03:30 h.
Sunday, May 6: from 10:00 to 23:00 h.
Follow this link to find out where exactly it is located and how to get there. 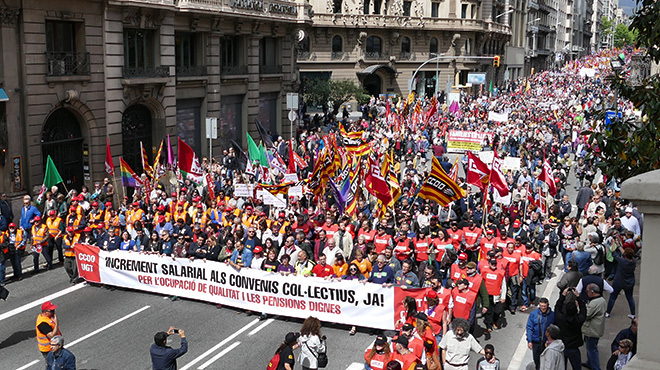 May 1st is a bank holiday: shops will be closed.If you wish to know about the planned demonstrations and how they will affect the bus service downtown Barcelona, follow this link. 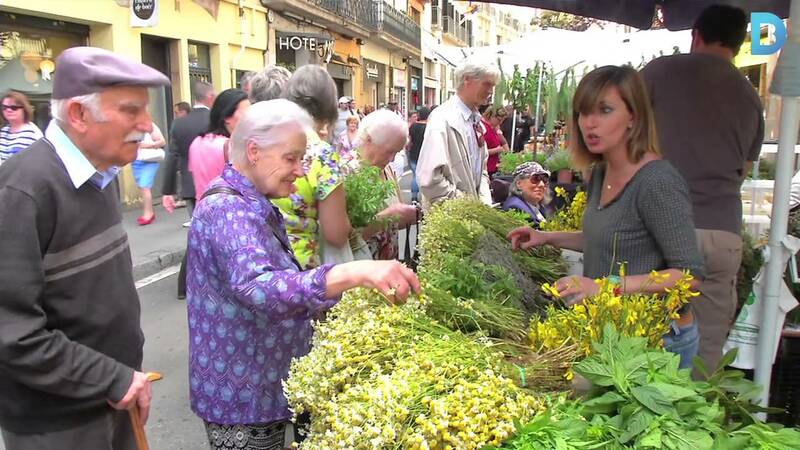 Barcelona celebrates this medicinal-herb fair since the middle age. From 1817 it is located in carrer de l’Hospital, in the Raval neigborhood. In this fair you will find medicinal herbs, honey, candied fruits, jam, artisan cheeses, and other natural products related to nutrition, beauty care and health. From 9 h to 21 h at Carrer Hospital, near La Rambla. 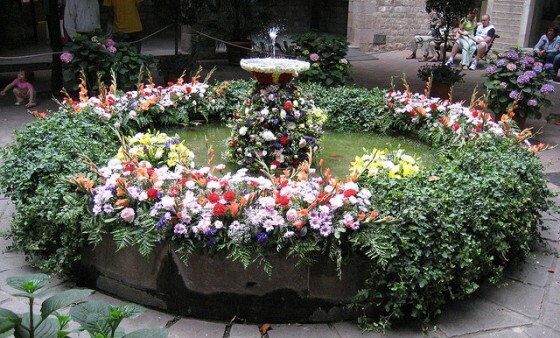 On Corpus Christi it is worth visiting l’ou com balla (the dancing egg) in the courtyards of many of Barcelona’s historical buildings. Particularly, in the cloister of Cathedral, and the courtyards of the Casa de l’Ardiaca, Ateneu Barcelonès, Archives of the Crown of Aragon (at the Lloctinent Palace), among many other places. The origin of this tradition, started in the XV century, is not totally clear. Find more information here and here. In addition to the dancing egg, there is a festive procession on Sunday and many other activities related to this festivity. See all the activities here. Download the entire program in PDF format (in Catalan). 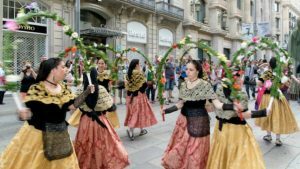 Also related to the Corpus Christi festivity, the catifes de flors (flowers carpets) cover the historical streets of Sitges. 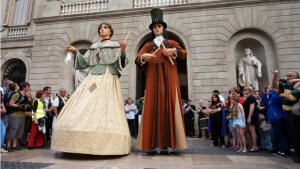 From 6pm on Saturday, the Giants Gather at Cap de la Vila. From around 8pm, flowers arrive and volunteers start sketching designs on the streets. They will be working on these until late into the night. From Sunday early morning, you will be able to visit them. More information here (sorry, no English version), here, and here. 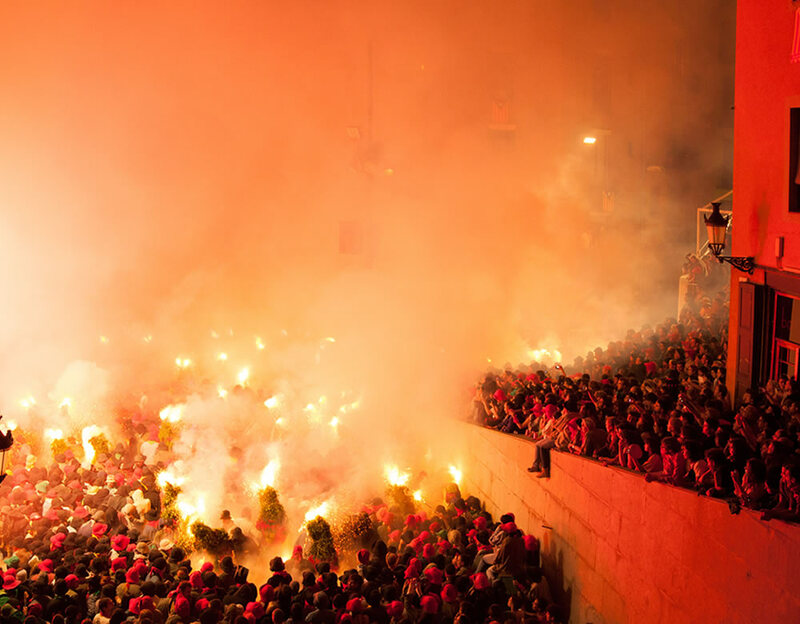 La Patum is a popular and traditional festival that is celebrated each year in the Catalan city of Berga (Barcelona) during Corpus Christi. It consists of a series of “dances” (balls) by townspeople dressed as mystical and symbolical figures, and accompanied either by the rhythm of a drum—the tabal, whose sound gives the festival its name—or band music. The balls are marked by their solemnity and their ample use of fire and pyrotechnics. You will find all the information about La Patum here. 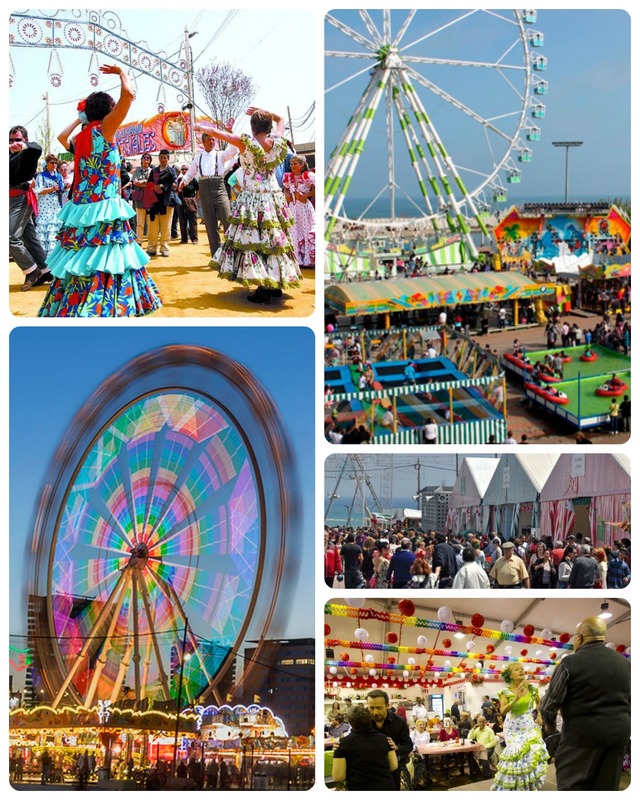 Gastronomic tapas festival. Located at the bottomost part of La Rambla, downtown Barcelona, it gathers 50 well known restaurants, tapas bars, and cake shops, who prepare small portions of their specialties. Further information here.